Tomorrowland had all the ingredients for a great movie — nostalgia, timeliness, and guaranteed audiences. How, then, did it bungle them so badly? It didn’t just bungle its elements. The film tanked, steered completely off-course, and presented, in the end, what feels like something made for TV. Tomorrowland in the Magic Kingdom, Tomorrowland in Disneyland, and Discoveryland in Disneyland Paris have been around for decades. The California original has been around since the days of Walt Disney himself. So they’ve had sixty years to get this movie right. The film is so carelessly thrown together that it’s insulting because they knew we’d go see it regardless of any bad reviews. We’re Disney fans — that’s what we do. The film follows Casey Newton (Britt Robertson), an aspiring rule-breaker who gets recruited by a creepy British robot girl named Athena to save the world. Athena is from Tomorrowland — another world in which technology has advanced to indescribable heights — and presents Casey with some vague, head-scratching plot of impending peril while they get chased by evil robots. We learn that Tomorrowland, despite its name, isn’t actually “the future” of our world. Instead, it’s another dimension entirely, a separate reality, completely unrelated to happenings on earth. Technically speaking, no one actually time-travels in this movie. They’re not hopping from the present to the future, but rather from one world to another. That left me badly confused. Casey learns that her world (ours) faces imminent doom. The “end as we know it” will happen in less than two months and there’s nothing anyone can do about it — except, of course, maybe, her. The end of the world is always so immediate in these movies. No one imagines us just petering out, a whimper rather than a bang. Tomorrowland becomes another hackneyed movie with a teenager racing against the clock with her new friends in tow. Kids like me grew up in Tomorrowland, and many of us are familiar with its mid-century style and Jules Verne-influenced, retro-futurist aesthetic. It is an antiquated vision of the future formed before Facebook. 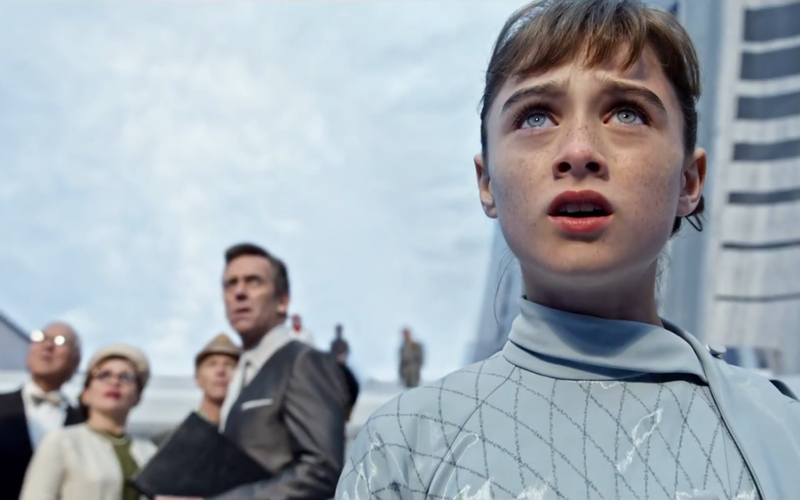 In that way, Tomorrowland — the “real” one, not this movie — is lovely and quaint. Walking through that section of the park, you understand that this is what they thought the present day would look like. There’s a beautiful nostalgia in that experience, which Tomorrowland employs none of. The film feels kiddie and unoriginal in the worst way. A movie that promised to reinvigorate an old section of Disney only made it look dull.